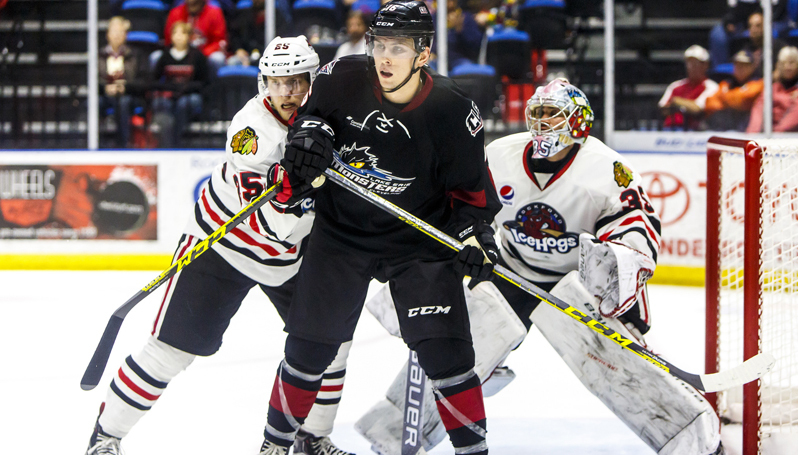 Rockford, Ill. - The Rockford IceHogs saw their come-from-behind effort thwarted by the Lake Erie Monsters Wednesday night as the visitors took a 5-2 win over the home side in the opening game of their Central Division Semifinals series. Joonas Korpisalo kept Rockford off the board until late in the third period, and former IceHog Alex Broadhurst had a goal and a pair of assists en route to first star honors. Despite a series of scoring chances for the home side, Lake Erie skated into the first intermission with a 2-0 advantage. Three minutes into the game, Jake Dowell tucked a pass to Mike Liambas at the top of the crease, who slammed his shot off the left pad of Korpisalo. Bryan Bickell tried to give the IceHogs the lead four minutes later after Ville Pokka ripped a slap shot on net, but Korpisalo kicked out his right leg to deny the rebound effort. Sonny Milano took advantage of Rockford’s poor fortune at 8:32 of the first on a give-and-go play with Ryan Craig. Milano streaked down the right wing and threw a backhand shot off the post, which ricocheted over Mac Carruth before deflecting off Pokka and over the line. Rookie defenseman Zach Werenski doubled the Monsters advantage with just 19 seconds remaining in the opening stanza. Broadhurst looked off the Rockford defense and tucked a pass to the low circle, where Werenski slammed it home for his second professional tally. The bounces continued to go against the IceHogs in the second period. On an early power play, Vince Hinostroza hit Mark McNeill in the high slot, who threw a shot off the end boards. The rebound caromed right to Tyler Motte, who slid the puck under Korpisalo, but it skittered off the far post and stayed out of the net. Lake Erie capitalized quickly on a man advantage after Dowell got the gate for slashing just before the 11-minute mark. Oliver Bjorkstrand pushed a feed from below the goal line to the high circle, where a waiting Dean Kukan wired a one-time blast over the blocker of Carruth at 11:11. Broadhurst picked up his third point of a game when the Monsters scored another power-play goal at 9:04 of the third period. Kukan whipped a cross-ice feed from the right wing through the penalty kill box of Rockford to Broadhurst in the far circle. The Monsters centerman lifted the puck over the glove of Carruth to extend the Monsters advantage to 4-0. Kero and Motte combined to spoil the shutout bid by Korpisalo with 5:06 left in the match. After Kero hit the post on the rush, he collected the puck behind the net and fed Motte, who was closing in on the right post. Motte buried the chance under the blocker of Korpisalo to kick off a comeback effort for the Hogs. With Carruth pulled in favor of the extra attacker, Bickell held the blue line before finding McNeill in the middle of the ice, who wristed a low shot on frame. Dennis Rasmussen scooped the rebound out of traffic and flicked a backhand over the glove of the sprawled Lake Erie netminder to pull within two at 16:18. After Matt Fraser was whistled for hooking with 2:06 to play, the Monsters tallied their third power-play goal of the evening when Trent Vogelhuber tracked down a clearing attempt and put it into an empty net to increase the score to 5-2. Carruth turned aside 21-of-25 shots while Korpisalo saved 28 Rockford shots. The IceHogs were held scoreless on four man advantages and allowed three goals on six Monsters power plays. Next Home Game: Thursday, April 21 vs. Lake Erie Monsters. The IceHogs play the second and final home game of the Central Division Semifinals when they host the Monsters in the back end of consecutive contests. The first 2,500 fans will get a rally towel thanks to BMO Harris Bank.